Medicine Wheel Natural Healing would like to thank everyone who came out to our Grand Opening on August 26th. We invite you to check out our videos from the days events and the picture gallery below! Thank you to all the vendors and participants in the day’s events. Rob Stevenson, the owner of Medicine Wheel began the event by thanking everyone for coming out. Brian Marquis is the President of the Ontario Indigenous Medical Cannabis Association then shared a few words. In the second part of this video, Marquis explains the purpose and mission of the National Indigenous Medical Cannabis Association. Herbalist Lisa Messenger was on site to share her knowledge of herbal medicine. Messenger has been trained in both Western and Indigenous modalities of herbal medicine, and will be working with Medicine Wheel Natural Healing to help clients with a wider range of herbal remedies. In this interview Rob explains why he started Medicine Wheel Natural Healing, and what he’s hoping to accomplish. Rob also discusses how his shop is giving back to the community, and describes the different medicinal cannabis products that are available at his store. This interview was conducted on June 21st, 2017 by Tom Keefer of Real People’s Media. The revolution in natural Indigenous healing associated with the cannabis plant has taken another significant step forward. Readers may be familiar with the booming medical cannabis industry in Tyendinaga Mohawk Territory, where there has been an explosive growth of Indigenous run cannabis dispensaries. That movement has inspired Rob Stevenson, an Anishinaabe man of the Bear Clan belonging to the Alderville First Nation, to launch his own business – the first Indigenous medical cannabis dispensary outside of Tyendinaga – on June 21, 2017. Medicine Wheel Natural Healing offers a wide range of products. This includes an array of different cannabis flowers including sativa, indica, and many specialized hybrids. The store also has different kinds of shatter, rosin, oil, distillates, gummies, tinctures, syrups, and vape pens. They also have an assortment of different edibles. Although the grand opening celebration and the party are yet to come (stay tuned for details), Stevenson did a ‘soft launch’ for the facility – located at 8986 County Road 45 Roseneath K0K 2X0 in Alderville First Nation – on June 21, 2017. The 21st of June is an auspicious day for Stevenson, not only because it is the summer solstice and National Aboriginal Day, but also because it is his birthday. The 37-year old’s tight knit family were present for the occasion, and are very supportive of his endeavour. Rob’s father Glen runs the family business, Stevenson Building Products, and has spent the last several months working with his son to completely renovate the new home of Medicine Wheel. Glen is also a big believer in his son’s cause. The entrance to the Medicine Wheel store. Stevenson has long had an interest in the cannabis plant and its healing properties. In the fall of 2016, he was in the process of establishing the Smoke Signals Seed Bank specializing in high-grade cannabis seeds. Then Stevenson caught wind of what the Mohawks were doing in Tyendinaga. In January of 2017, Stevenson saw the invite to the founding meeting of the National Indigenous Medical Cannabis Association. Intrigued by the group’s mandate of encouraging “the self-regulation of the Indigenous Medical Cannabis Industry through the application of Indigenous political and economic principles,” he decided that he had to come and see for himself. Because the Canadian government showed no willingness to consult Indigenous peoples about their upcoming proposals for cannabis legalization, NIMCA decided that it wouldn’t wait around for Canadian approval, and proceeded proactively on the basis of Indigenous rights. Energized by meeting with some 40 other Indigenous people looking for ways that cannabis as a plant could benefit their communities, Stevenson became active with the group and was soon nominated to a position as the Ontario Vice President of the Indigenous Medical Cannabis Association. In that role, Stevenson worked to distil some guidelines and best practices from dispensaries already operating in Tyendinaga and learned as much as he could from the Tyendinaga dispensary model pioneered by Tim Barnhart and Legacy 420. Stevenson wants everything in his business to be above ground and legitimate. Coming from a lifetime of activity with a successful family construction business, and surrounded by a great group of highly motivated and talented employees from his community, Stevenson is hoping to create a model that other indigenous people can use in their medical cannabis efforts. Stevenson wants to see the industry grow, and he welcomes competition and even the growth of other dispensaries in his home community. “There’s more than enough for every single person in my community to find opportunities to benefit from this industry and all of its related domains,” points out Stevenson. Rob Stevenson explains how the registration form works. 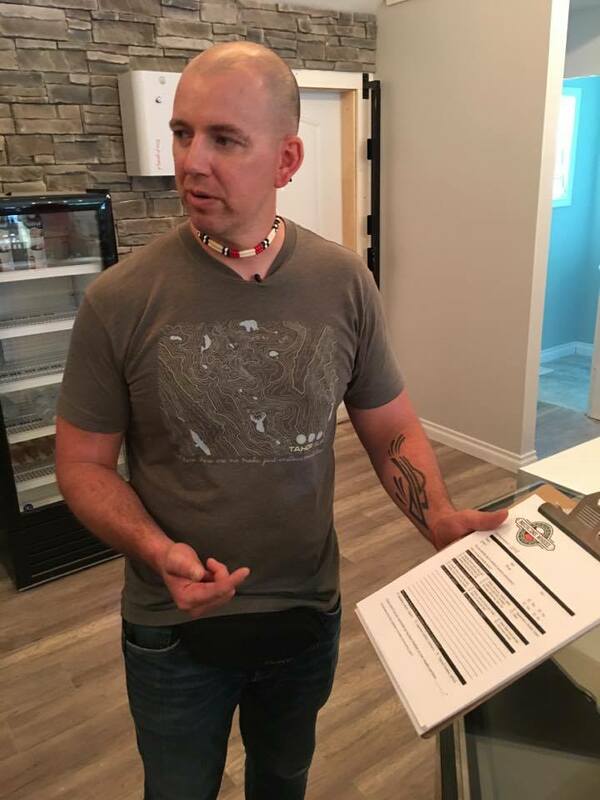 Before a customer can buy any product, they must first go to Medicine Wheel’s “consultation counter.” At the counter, they meet with a staff person and are required to fill out a one-page form about their medical history and relationship to cannabis. After identifying their need for cannabis, customers are provided with a membership card. The card is scanned into the point-of-sale system with all purchases, and this allows Medicine Wheel and the customer to track and monitor their medical progress. This could result in either increasing dosage or changing strains or using different products altogether. Medicine Wheel’s primary incentive is not profit but helping people. Aware that they are functioning in the era of a new information technology economy, Stevenson seeks to operate their store on the cutting edge of medical technology. That means using the internet as a learning tool, and seeking out “the cannabis experts emerging from the underground” as Glen puts it. The keeping of medical data and records for their patients, and using that medical data to help people and to advance what to date is an understudied field of medical learning, is a key part of this practice. 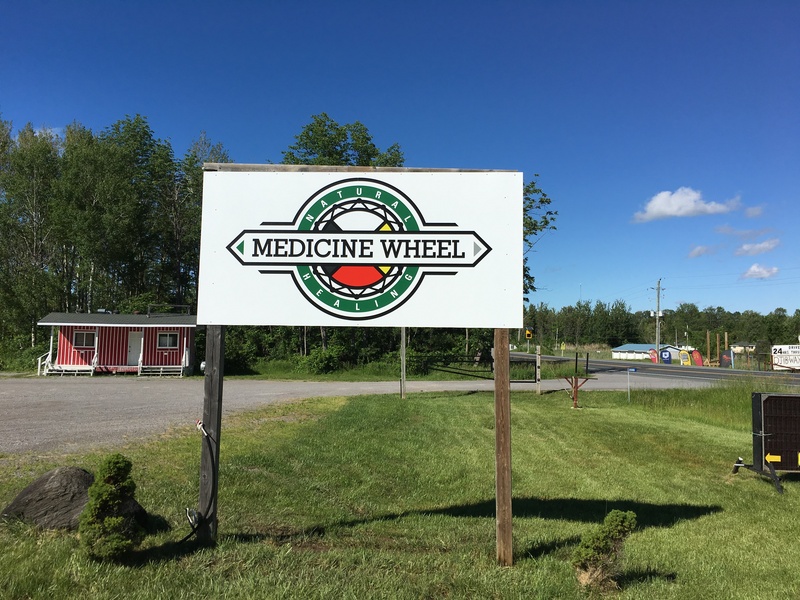 The Medicine Wheel Healing Centre is located on Alderville First Nation 8986 county road 45 Roseneath K0K 2X0 just off of Highway 45, near the town of Roseneath. The Alderville First Nation is located on the south shore of Rice Lake. Peterborough is on the North side of the lake, Oshawa is to the west, and Coburg and Port Hope are due south on Highway 45. The store is open 11am-7pm, Tuesday through Sunday and closed on Mondays. Call anytime at (905) 352-3322.